We are a global outsourcing provider offering cost-effective illustrations, cover designs, and inner layouts. Over the last two decades we've successfully completed 120,000+ designs and aided 2,000+ global clients. O2I takes your layout and formatting ideas and does the overall layout and formatting including insertion of images, drop caps, fonts, chapter titles, page number placement, tables, charts, text boxes, graphs, lists, subheading, block quotes, footnotes, and poetry. You can also pre style your book. Features include fully customizable designs, advanced formatting options, recommended for specialty books like textbooks, structured poetry, etc. and have two rounds of free revisions. We also provide customized magazine layout design services. From the selection of the right typography to placement and sizing on the page, we work a careful balance of white space and content to ensure readability and marketability of the magazine. We ensure formats, resolutions, and fonts are print-ready, and handle proofing to check if colors, fonts, and other elements are in the right place. This includes live linking with Adobe InDesign,digital dummies for soft proofs, pre-flight checking, etc. Customer uploads file to a secure FTP (File Transfer Protocol), Dropbox etc. Why You Should Outsource Layout and Formatting Services to O2I? Industry-Specific Software - We use Adobe InDesign, QuarkXpress, Adobe Illustrator, Adobe Photoshop, Corel Draw etc. Skilled Team - 20+ team of qualified designers, formatters, illustrators, etc. 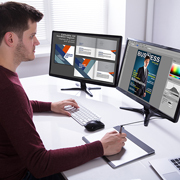 We helped a firm with prepress requirements for a huge volume of documents (using little known PrintShopMail and PlanetPress software). This brought a high cost savings to the client. Outsource2india has been a pioneer in providing the best quality layout and formatting design services and a plethora of other creative design services. We deliver high quality, cost-effective, and efficient artwork outsourcing services and other services including Data Management, Creative Services, Transcription, and other services. Contact us for accurate layout and formatting design services, in-house expertise, and cost-effectiveness. Tell us your requirement and we will give you a FREE quote within one business day.